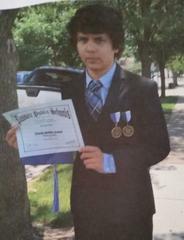 Missing Child: Duncan Diaz, 14, HM, 5'8", 130 lbs. Last seen: Passaic, N.J., on 6/30 at 8 a.m.
Duncan Diaz, 14, Hispanic male, 5'8", 130 pounds, brown eyes, black hair, and a light complexion. Duncan was last seen leaving his apartment building in Passaic, N.J. on Tuesday, June 30, at 8:00 a.m. He was last seen wearing a white tee-shirt with "Hollister" printed on it, blue jeans, and black and white Nike sneakers. Anyone with information that can assist in helping safely locate Duncan Diaz is asked to call the New Jersey State Police Missing Persons Unit at (609) 882-2000 ext. 2893 or Passaic Police Youth Services at (973) 365-3995.